Facing foreclosure can be a big setback to your life goals. Just because you are not able to pay off your mortgage doesn’t mean that your lender can take advantage of your situation. There are still certain laws they must follow when you are facing foreclosure. If your lender is violating a law, our foreclosure attorneys can stop the foreclosure process immediately. Call us immediately to get help from our foreclosure attorneys! You can reach us at (818) 254-8413. Here are 5 things that your lender cannot do when you are facing foreclosure. 1. Your lender is giving you misleading information of options to save your home. You go to your lender to see if there are any way to save your home from foreclosure. The advice they tell you for saving your home must not be misleading. Meaning, they cannot give you advice that will cause you to fall further behind on payments or drive you closer to foreclosure. 2. Your lender is sending you foreclosure notices while you applied for a loan modification. In California, it is against the law for lenders to participate in dual tracking. Dual tracking is when the lender moves forward with foreclosure while the homeowner applied for a loan modification. When lenders do this, they are hoping to make homeowners think as if they will have lower monthly payments. And, when the foreclosure date approaches, they deny the application, leaving homeowners little to no option to stop foreclosure. 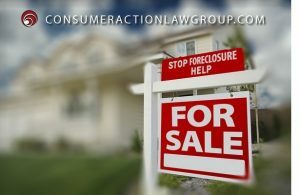 You can get foreclosure help by contacting an experienced foreclosure attorney. 3. Your lender lied to you about stopping foreclosure while you were being reviewed for modification. Again, it is illegal for the lender to move forward with foreclosure while the homeowner is being reviewed for modification. But in this case, the lender lied to the homeowner about stopping foreclosure. The lender cannot lie about stopping foreclosure while the homeowner is being reviewed for loan modifications. 4. Your lender refuses to honor turning trial modification into a permanent modification. When a homeowner fulfills the requirements of a trial modification, the lender must honor turning it into a permanent modification. In some cases, however, the lender accepts the payments from the trial months but refuses to transform the trial modification into a permanent modification. 5. Your lender cannot delay application processes. Giving you late notices for documents or ‘losing’ documents are considered delaying the application process. Lenders may purposely do this in order to waste the homeowner’s time until the foreclosure date arrives. The homeowners are then left with no choice but to foreclose on their home. There are many things lenders cannot do when homeowners are facing foreclosure. If the lenders are or have partaken in these illegal practices, call us immediately to get help with foreclosure. One of our experienced foreclosure attorneys will speak with you and give you legal advice. You can reach us at (818) 254-8413. Our consultation is FREE!